Bold Stadium will include a covered grandstand designed and positioned so that at kick-off most fans will be seated in the shade. Austin Bold FC, Austin's locally-owned professional soccer team, is on its way to making a purpose-built pro soccer stadium a reality in Austin. The stadium has been engineered with the soccer fan and soccer player in mind and is sure to fire-up fans ahead of the Bold's inaugural spring 2019 season. The more than 5,000 seat Bold Stadium will be located adjacent to the Grand Plaza at Circuit of The Americas (COTA), the premier destination for entertainment and motorsports in the United States. By locating its stadium in the heart of COTA, Austin Bold FC can take advantage of existing infrastructure and amenities such as parking and concessions. That means the $5 million stadium construction cost can be invested directly into the stadium itself, with a focus on creating a quality experience for both the fans and the players. The entire construction cost is privately financed by local ownership. Bold Stadium will include a covered grandstand designed and positioned so that at kick-off most fans will be seated in the shade. There will be no bleachers — all seats will be individual chairs with chairbacks. Home and Visitor locker rooms will be located under the stands with the players' entrance to the pitch designed for maximum excitement for fans and players alike. Austin Bold FC's fans (over age 21) also can choose from one of 60 bar-style stadium seats, complete with bar stools and a table-top drink rail, all located next to a concession stand. The pitch itself will be world-class featuring a top-of-the-line and multi-layered drainage system, premium root layer and computerized irrigation system. The turf will consist of two types of grasses. The pitch will initially be seeded with cool season grasses which will be the primary turf during the early season games. As winter breaks, and the temperatures rise, it will be overseeded with Bermuda grass which is heat tolerant and perfectly suited for the local climate. 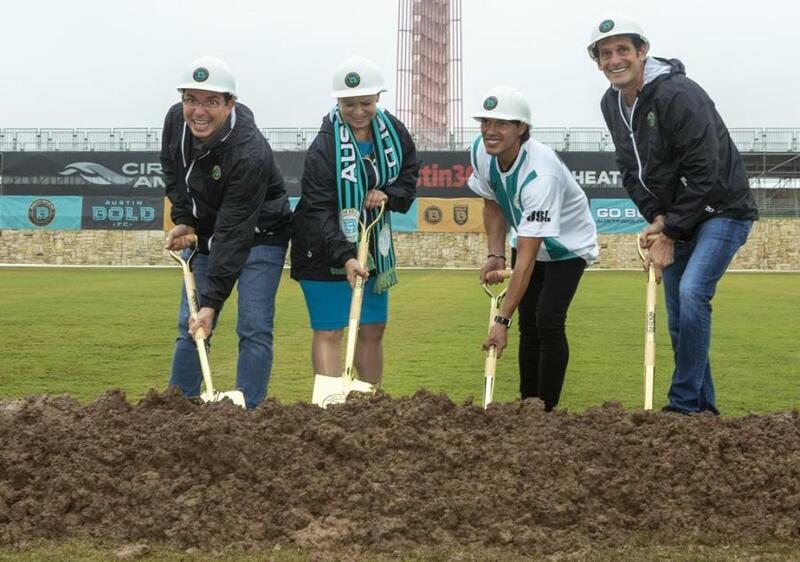 "The Austin soccer community is passionate about the sport, and we're committed to building a stadium and offering a fan experience that's exciting, enjoyable and affordable for families and close to the action," said Bobby Epstein, chairman of Austin Bold FC. "We've also gone to great lengths on the technical design and quality of the field we're installing. This will be a premier pitch, where veteran players and future stars alike will want to compete." Austin Bold FC is part of USL (United Soccer League), which includes more than 30 professional soccer teams in the United States and Canada. "Austin Bold FC is well on its way to having a talented side and fantastic stadium that we're confident will take the USL, and the soccer world, by storm," said USL CEO Alec Papadakis. "Austin is a dynamic and thriving city and we look forward to an exciting inaugural season there this spring." For more information, visit austinboldfc.com.